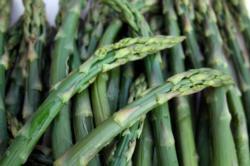 Asparagus is a perennial plant that can produce for years if grown with care. Choose a site in full sun and prepare the soil well. The plants send up 5-foot tall, ferny growth over the summer, so plant them where they won't undesirably shade other plants. Asparagus plants will be either male or female. The female plants produce seeds which consume energy from the plant. Newer, hybrid varieties, have been developed to be primarily or all male plants, thereby increasing yield. Plant crowns Oct–Nov or Jan–Mar. Direct seeding is difficult, so it is recommended to transplant 1-year old crowns. Do not harvest the first two years and only harvest lightly the third year. The energy of the plants needs to be directed to root development so the plants can get well established before they are harvested regularly. Once plants are established, harvest shoots for a few weeks in the early spring as new ones emerge. Cut spears with a sharp knife at the soil line. Stop harvesting when spears are thinner than a pencil. Allow the ferns to grow over the summer to replenish the roots, then prune to the ground when they turn brown (or in January). Support ferns on a trellis to save garden space. Water deeply, long enough to wet the soil several feet deep. Avoid wetting foliage and spears if possible. For “white” asparagus, simply cover the spears with soil as they grow. Cutting off their light supply will keep them white.